NEW for 2019! Students will be creating new color families not previously dyed in Carol’s classes. This is a THIRD set of families, and we will be using some different yellow. red, and blue dyes as primaries than in previous classes. If you have been wanting a new set of samples, but would rather do the work cooperatively with classmates, this is your opportunity! Dye the color you choose, not the color that chooses you! Explore the unlimited number of hues possible by mixing only pure reds, yellows, and blues of Procion MX fiber reactive dye. Teams of students will use different sets of primaries that when mixed will yield hundreds of colors in a wide range of values. Sharing the results, each student will build a sample book of more than 1,000 dye swatches and their recipes on 100% cotton fabric. This book will become an invaluable reference for future dyeing. 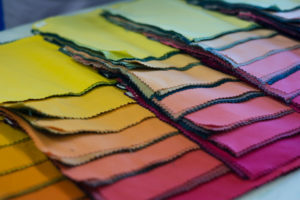 Using the sample book as a guide, each student will apply the basic techniques of dyeing, including dyeing value gradations, over-dyeing, and low water immersion techniques. Along with this hands-on approach, students will come to understand color theory in three-dimensional model that goes beyond the color wheel. We will examine the difference between color theory and color reality, and break through the confusions of so many color systems that are not dye-based. This course will be a wonderful foundation for wearable artists, quilters, needleworkers, weavers, and dyers of cellulose fibers and silk, or for anyone who wants to learn more about the interactions of color.